In this ravingly busy life, one of the best ways to improve your health is to consume lots of fresh vegetables. Abel & Cole and Riverford Organics are my lifeline because twice weekly they bring a wide variety of organic, fresh produce direct to my door. I always buy half a dozen or so avocados every week because they happen to be one of the healthiest things you can eat. They’re rich in monounsaturated fat that your body can easily burn for energy and moreover the fat they contain helps your body absorb fat-soluble nutrients from other foods you eat with them. 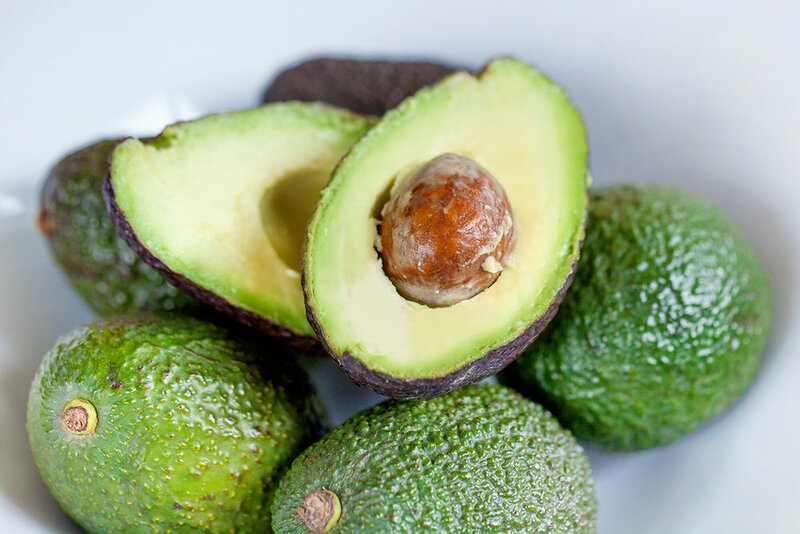 Actually, avocados are not a vegetable, they’re a very-low-in-fructose fruit with a buttery texture and delicious flavour that means they’re my number one go-to favourite snack when I want something quick and savoury to eat. For simplicity and satiety, I like to halve and stone them before stuffing the cavities beyond reason with prawns or tuna mayo. Prawns bound together with a spicy, tomatoey mayonnaise atop a halved avocado was the first food I ever prepared for my husband John. It was love at first sight - he’d always thought such food, simple as it is, only came out of restaurant kitchens! On a more fruity note, avocados can be transformed into a silky, delectable dark chocolate or avocado and lime mousse or used as a base for ice cream. Yum! Full of essential vitamins and minerals, including fibre, vitamins K, B5, B6 and C, folate and more than twice the potassium of a banana, you can see where I’m going with this. Today my fancy is for avocado hummus. 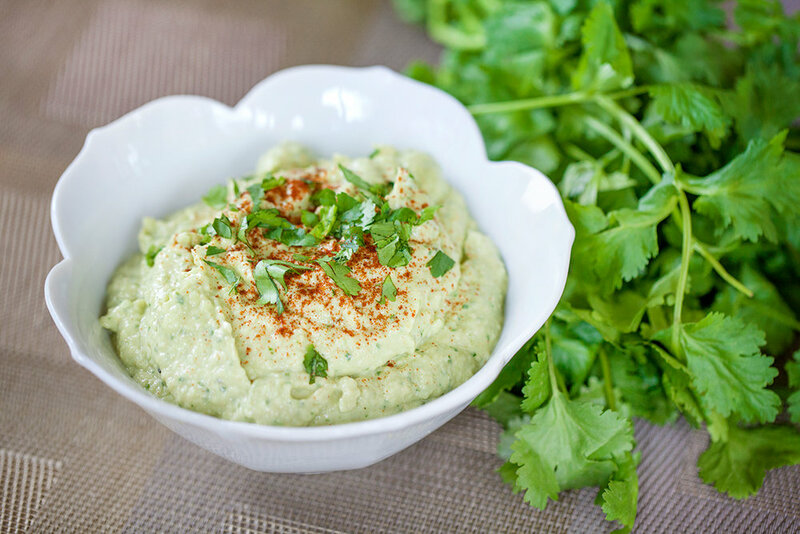 I love traditional chickpea hummus but can see no reason to take the anti-nutrient, high carbohydrate hit from legumes when this creamy avocado dip is a far healthier, yet comparative alternative. I first eyeballed Paleo Hacks version of Bean-Free Creamy Avocado ‘Hummus on their blog but glancing down the list of ingredients quickly assessed they were too out of whack for my taste (what’s with a teaspoon of lemon juice?). I’ve re-written the recipe to balance out the flavours and it works. Beautiful to look at and delicious to eat, it’s a really fresh, clean ‘take’ on hummus. Apologies to garlic lovers, there is none in my version of Creamy Avocado ‘Hummus’ because its whiffiness on post-consumption breath always offends me! A quick and easy keto way to get your five a day. Slice off the ends of both courgettes, peel, then lay them on a cutting board and slice them in half lengthwise. Using the pointy end of a teaspoon run it down the middle of the courgettes, gently scooping out the seeds. Chop the courgette into rough pieces. Discard the seeds. Peel and de-stone the avocados, roughly chop into pieces. Place the avocado, courgette, olive oil, lemon juice, tahini, cumin, cayenne pepper, most of the coriander leaves and salt in a food processor. Transfer to a bowl, sprinkle with paprika and the remaining coriander leaves before serving with a selection of freshly cut crudités for dipping. Fat 32g Protein 6g Carbohydrate 4g - per serving of ‘hummus’ only. I was slowly but surely getting through the training programme to become a qualified health coach until I was recently stopped in my tracks. Last week I received an email announcing “numerous coursework and program updates” that were being rolled out now and later this year. Gees! They don’t mean maybe. The volume of coursework has increased by a hefty 60% and I can’t now move on through the 16 original lessons and exams unless I first go back and then sequentially complete each of the new business building tasks interspersed between them. It’s not easy being forced to switch between academia and creative writing on demand - I simply don’t have the time or headspace for both - and last week’s task, which was to write ‘my story’, overwhelmed me. Firstly, who cares what trials and tribulations I’ve suffered? Secondly, it seems if anyone does, it’s me! I found wading through the timeline of my life and reliving the experience extremely upsetting. So today, I’m taking some welcome time out to write this blog. For sanity’s sake, I have to loosen my grip on my study work and let go of my original intention to be an accredited health coach before the end of the year. After all, there are so many other things I have to do. Without the support of my husband, who steps into the domestic breach every time he finds me glued to my computer, I would have given up completely. Economy of effort is where it’s at and Celeriac Terrine With Red Pepper Sauce is one of those meals that John can prepare single-handedly so that we’re still well fed even when I’m overly committed to tasks beyond the kitchen table. Celeriac Terrine With Red Pepper Sauce makes an impressive vegetarian meal for six people. Since there are only three of us to feed, that means enough leftovers to slice-up cold several days later, which you can then generously top with more cheese before reheating in the oven for 15 minutes and gently warming through the leftover red pepper sauce on the hob. Alternatively, the terrine eats equally well cold with homemade mayonnaise and salad leaves, preceded by a delicious creamy, hot tomato and red pepper soup that’s simply thrown together in minutes by combining the leftover red pepper sauce with a bottle of Abel & Coles cherry tomato passata and a generous dollop of double cream. Voilà, two nutritious, keto-inspired meals for the price of one! Celeriac, otherwise known as celery root, is a bit of a culinary life saver when you’re living a low-carb lifestyle. Although a root vegetable, celeriac isn’t nearly as starchy as potatoes (potatoes contain over twice as many net carbohydrates) so it’s really useful for making mash, chips, gratins and soups - watercress soup thickened with celeriac instead of potato is even better. High in dietary fibre and loaded with vitamins and minerals for maintaining good health, this recipe totally transforms celeriac from its reputation as the gnarly hobbit of the vegetable world into a very elegant looking, make-ahead main course for entertaining, or a much more appetisingly colourful, meat-free alternative to a family roast. A long-standing favourite of ours, this recipe is taken from the Winter section of Rose Elliot’s book ‘Vegetarian Four Seasons’. However, while I can still buy organic celeriac in May, I make no apology for enjoying it in Spring! It’s simply delicious food, whenever! Grease and line a 450g / 1lb loaf tin with a piece of non-stick parchment paper to cover the base and extend up the short sides. Grease again. Boil a kettle of freshly filtered water. Peel the celeriac and cut into even-sized 2cm chunks. Pour the boiling water from the kettle into the base of a steamer. Place the celeriac into the top of the steamer and cook for about 12-15 minutes, or until the celeriac is tender. Lift the celeriac out of the steamer and drain well before tipping into a bowl - the water in the bottom of the steamer makes wonderful stock. Add the butter to the celeriac and mash, but don’t puree because some texture is good in this dish. Mix in the grated Cheddar and Parmesan cheeses, the chives, eggs and salt and pepper to taste. Spoon the mixture into the prepared tin and level the top. Bake for about 50 minutes or until the terrine feels firm to the touch, is golden-brown and a skewer inserted in the middle comes out clean. While the terrine is baking make the red pepper sauce. Heat the oil in a large saucepan, put in the onions and cook over a gentle heat with the pan lid on for about 10 minutes until the onions are softened but not browned. Meanwhile, wash the peppers and cut into rough pieces - there’s no need to remove the seeds because the sauce will be strained. Add the peppers to the onions, cover the pan again and cook gently for a further 5 minutes. Pour in the stock. Cover and simmer for about 10 minutes or until the peppers are tender. Liquidise the sauce, strain into a clean saucepan and season to taste. When the terrine is cooked, remove from the oven and allow to stand for 5 minutes or so before slipping a knife around the edges to loosen, then turn it out onto a warm plate. Garnish the terrine with halved cherry tomatoes, sprigs of parsley and small strips of chives. Just before serving, bring the pepper sauce to the boil. Take off the heat and whisk in the cold butter, a little at a time, to make the sauce glossy. Serve the sauce with the terrine and some lightly cooked broccoli or other green vegetables. What to say about this jammy delight? Simply that it’s a healthy alternative to regular jam that can be made in less than 5 minutes flat. I recommend you keep a pot of it in your fridge to slather on toasted Vegan Paleo Nut & Seed Bread - trust me, there are few better ways to start the day than with freshly brewed coffee and pure raspberry jam spread thickly on buttered toast! Also delicious served with Grain-Free Scones, for making into smoothies, as a topping for yogurt or ice cream and for sandwiching together Primal Plate’s Vegan Victoria Sandwich Cake. Place all the ingredients into a blender or food processor and pulse gently until just smooth. Taste and add a little more Sukrin:1 (or a couple of drops of liquid stevia) if you would like a sweeter jam. Transfer the mixture to a glass container with a lid (I used a mason jar) and allow to set in the fridge. This jam is veering towards the tart, which is how I like it! If you want it to taste more like regular jam (sweeter) and you’re not keeping to a keto (very low carb) diet, a tablespoon of raw, organic ‘runny’ honey or maple syrup (for vegans) would be a better choice. Carbohydrate 36g Protein 8g - per whole pot of jam! I’m sort of selling myself short on today’s recipe title because this gravy may well be the best ever gravy for everyone; vegan, vegetarian and carnivore alike. It doesn’t need meat juices from the roasting pan for depth of flavour, this stand-alone gravy is as intensely flavoursome as any I’ve tasted…ever! Better still, it can be made well in advance, so there’s no last minute panic to rustle up a tasty gravy whilst the rest of dinner goes cold. Simply make ahead of time then, whilst you’re plating up the rest of the meal, re-heat your gravy to boiling point and pour over. I knocked this vegetarian gravy up ‘out of the blue’ in about 15 minutes flat whilst the Nut Loaf that was featured on last week’s Primal Plate blog was resting in its tin before being turned out and sliced. Frantically looking around my kitchen for any ingredients that I could gravy-fie to get our meal onto the table pronto, the first thing I espied was the tomato juice leftover from a 400g tin of chopped tomatoes I’d used to make the Nut Loaf. The second was my husband’s glass of red wine poured in readiness for dinner. Combined with a few other store cupboard ingredients - not least Sukrin almond flour to thicken - it was gravy alchemy. A light, bright, delicious, vegetarian accompaniment to elevate the pure and simple into the most tasty meal imaginable. Heat the olive oil in a medium sized saucepan. Add the chopped onion and cook gently with the pan lid on for about 8-10 minutes, stirring occasionally, until the onion is soft and light golden in colour. Meanwhile, in a small bowl, combine the Sukrin almond flour with a little of the tomato juice, stirring well to make sure there are no lumps before adding the rest of tomato juice. Set aside. When the onions are soft and golden, take the saucepan off the heat and add the tomato puree and bouillon powder. Stir everything together really well until it forms into a smooth-ish paste then add the red wine. Keep stirring until this is fully integrated, then do the same with the almond flour/tomato juice mixture. Finally add the water, the tamari, the Marmite and the bay leaf (if using). Set the pan back over a medium-hot heat and stir continuously until the gravy comes to the boil and has thickened slightly. Turn the heat down to a simmer and continue cooking, uncovered, for a further 10 to 15 minutes. Strain the gravy through a stainless steel sieve into a clean saucepan - I also like to press about half of the softened onions through the sieve to achieve a gravy with a bit more substance. Cover the pan and set aside until you’re ready to eat. Alternatively, strain into a clean glass or ceramic bowl, cover and store in the refrigerator for up to a week. The drained chopped tomatoes can be used to make Nut Roast, Virgin Mary Vegetable Cocktail (recipe coming soon) and Coconut King Prawn Curry (recipe also coming soon) - as you can see I’m currently awash with ideas for organic tinned tomato recipes! I’ve not included sea salt or freshly ground pepper in the ingredients list for this recipe because quite frankly the Swiss bouillon powder, tamari and Marmite do the trick without. However, if you’re using ‘no-salt’ natural yeast extract you might want to test for seasoning and adjust to taste if needs be. Last week, in the run up to Easter, our Nespresso machine, main oven and microwave all conked out over three consecutive days. The repairs and/or replacement of the coffee machine and oven are still outstanding, but did you know that in this day and age you can actually order a microwave on Easter Saturday afternoon and have it delivered free of charge on Easter Sunday morning? Really? Does no one take time out any more for those ‘we-wanna-be-together’ happy-holiday, family occasions, which for us means coming together to share some exceptional food and drink. Ah well, their loss, our gain. Not that I need a microwave for anything other than warming plates, but still, when you’ve only a half-sized oven left to cook in, you simply can’t have empty plates occupying the space. As if nothing else could go wrong, it did! I’d already made our Easter lunch starter to feature on last week’s blog but to get even further ahead of our Easter celebrations (after all, I do have my third share of a bottle of LPR Champagne to drink before lunch is served!) I decided to make little lemon cream pots for dessert (think lemon tart filling without the pastry). Usually, when I’m trying out a recipe for the first time, I deliberately override my natural instincts and do exactly what the recipe tells me to. Oftentimes, it’s a big mistake but, hey, I’m not always in the mood for original thought! On this occasion, at a quarter to midnight on Saturday night, I was spooning twelve ramekins worth of expensive ingredients into the waste bin! Nor did I realise, until I finally got to bed at 2:16 am, that the clocks had gone forward and it was now only 4 hours before I needed to get up again! It’s at times like these that I am so grateful for Primal Plate. I don’t know if there’s anyone else ‘out there’ cooking Primal Plate recipes, but that becomes secondary when I actually find my own food blog the most essential guide to eating well every day! On Easter Sunday morning, just using the site’s search facility for ‘lemon’ was enough to spark the idea of Lemon Curd Ice Cream. The rest is down to what’s in the fridge. Hence it was a case of making ice cream with Co Yo natural coconut milk yogurt and the remnants in a pot of crème fraîche, or making something else. Turns out, if you simply stir lemon curd, coconut milk yogurt and crème fraîche together in a bowl and freeze, the result is food alchemy - a deliciously bright, light, primrose-yellow, zingy, creamy-smooth ice cream. Purplish-blue Vodka Blueberry Compote and sunshiny Lemon Curd Ice Cream - sweetened with raw organic honey - is the perfect match in this refreshing, tangy dessert. Lemon and blue always look good together and juicy blueberries and lemons are a heady, flavour pairing that’s cooling, floral, citrusy and fresh - reminiscent of springtime and all things bright and beautiful. If, at first glance, you think the recipe below looks a little complex, look again. The lemon curd takes less than 15 minutes to make, the 3-ingredient ice cream about 10 minutes and the blueberry compote even less than that! Lemon Curd Ice Cream With Vodka Blueberry Compote is in fact a spectacularly easy, make-ahead, special occasion dessert. Cool, sophisticated, delectable…there aren’t enough superlatives to do this enticing, Vitamin C packed fruit dessert justice! In a stainless steel bowl, whisk together the eggs, honey and 80ml lemon juice until well blended. Cut the butter into small pieces. Cook for approximately 6-8 minutes, whisking constantly with a balloon whisk (to prevent it from curdling) until the mixture becomes thick (like soured cream or hollandaise sauce). Don’t get distracted, the mixture can quickly and suddenly turn from thin to thick! Add the butter to the mixture and whisk until it has melted, then add the grated lemon zest, the rest of the lemon juice and 2 drops liquid stevia. Give everything a good stir then taste. If you think the lemon curd is still too tart, stir in another single drop of stevia. Tip all the ingredients into a bowl and stir together well. Churn the ice cream in an ice cream maker until soft-set consistency, then quickly transfer to a plastic freeze-proof container and freeze until solid. If you don’t have an ice cream machine, pour into a plastic freeze-proof container and freeze for about an hour-and-a-half until the sides start to get solid. Then mash with a fork to combine the solid ice cream at the sides of the container with the softer centre. Straightaway, put it back into the freezer and freeze until solid. Take out of the freezer and put in the refrigerator 20-30 minutes before serving to allow the ice cream to soften slightly. Combine the blueberries, lemon juice and the fruit spread in a medium saucepan over medium heat and cook for about 5 minutes or until the fruit spread dissolves, the blueberry juices start to run and the mixture becomes syrupy - don’t let the berries cook too long or they will become mushy and lose their beautiful shape. Take the pan off the heat. In a small bowl or tea cup, combine the arrowroot powder with a little of the vodka until a very thin paste is formed. Add a little of the hot blueberry juice to the slaked arrowroot to even out the temperature between the two mixtures, then quickly pour the arrowroot mix into the berry compote, stirring continuously as you do so. Put the pan back on the heat and keep stirring until the mixture thickens slightly (just below boiling point). Stir in the rest of the vodka. Remove from the heat. Tip into a bowl and lay a piece of cling film directly onto the surface of the compote to stop the air getting to it - i.e. to stop a skin from forming. Continuing my quest to find Primal Pronto veggie-inspired meals, I discovered these delicious Green Pea Fritters at The Healthy Chef. Initially, I was just looking for an alternative to Primal Naan Bread and Cauliflower Rice to accompany a family supper of Roasted Cauliflower & Mushroom Curry because, as satisfying as Primal naan bread might sound, since posting the original naan bread recipe I subsequently found out that I need to re-invent it without tapioca flour, (which increases blood sugar even more than wheat flour) and zanthan gum. Yikes! Sorry for the oversight! Plus, cauliflower ‘rice’ and cauliflower curry have zero gastronomic appeal when eaten in combo, so I wanted something new and tasty, preferably vegetable-based, to make our curry meal more appetising. As it turned out, the Green Pea Fritters were such a hit that I’m including them as part of this week’s blog, so today, three recipe posts for the price of one! Whilst the Green Pea Fritters and Avocado Cream are a perfect stand-alone meal for a fast and simple supper or to serve with drinks, when brought together with Roasted Cauliflower & Mushroom Curry you have several wonderful things that make for a fresh, creative, vegetarian meal fit for entertaining friends. I think the whole thing looks mouthwatering on the plate and it tastes just as good - spicy, savoury, creamy and delicious! The cauliflower and mushroom curry recipe is adapted from a recipe in Daniel Green’s book, The Paleo Diet but there is one notable exception - if you try to make this curry with “1 tablespoon of chilli powder (or more to taste)” as directed in the book, please do not even think of inviting me for supper! It may simply be a ‘typo’ (I think it should read 1 teaspoon of chilli!) but it would nevertheless be ruinous to the finished dish and most likely would get missed by an inexperienced cook slavishly following the recipe. Thank goodness for Primal Plate’s extensive testing and tasting of all blog featured recipes before posting! I have added tiger nut flour to the pea fritter recipe to enhance the sweetness of the peas and on this occasion left out the lemon zest in favour of fresh mint because a) fresh mint and peas are a classic and b) the avocado cream has a lemony ‘hit’ all of its own that more than compensates for its absence in the fritters. Plus, it saves the time and effort of grating a lemon! The pea fritters are very quick and easy to make - it’s just a matter of mixing everything together in a bowl and dropping spoonfuls of the mixture into a hot frying pan (only a few at a time), pressing them flat with the help of a spatula and cooking (for less than a total of 10 minutes) until they’re golden brown on each side. Meanwhile the avocado and cream cheese can be quickly whizzed to a luscious pale green cream in a food processor or with a hand-held blender. The Roasted Cauliflower and Mushroom Curry is just as fuss-free and makes a great vegetarian low-carbohydrate option for followers of Paleo and Primal diets. Put it all together for warming, nourishing mouthfuls of extreme pleasure. Crush the peas in a food processor using the pulse button. Make sure you keep the peas a coarse texture, this is not meant to be a puree. Transfer the crushed peas to a bowl, add the parsley, mint, eggs, lemon zest (if using), tiger nut and coconut flours. The ground tiger nuts and coconut flour help to hold the mixture together during cooking. Season with the sea salt and freshly ground black pepper. Taste and correct the seasoning if necessary. Soften the cream cheese by breaking it down with a fork then add to the pea fritter batter and combine well. Heat a little olive oil in a large heavy-based non-stick frying pan over a low heat. Add heaped tablespoons of the pea fritter mixture to the pan - you should get about 16 bite-sized fritters. To avoid overcrowding the pan you may need to cook them in several batches. Cook the pea fritters over a medium heat for 5-6 minutes without disturbing them. When they are firm and golden on the underside, carefully turn them over with the aid of a flat-ended spatula. Continue to cook for a further 3-5 minutes or until the fritters are cooked through and golden brown on both sides. Immediately transfer to an oven proof dish (or serving platter if you’re handing them out with drinks) and then into a pre-heated hot oven until you’ve cooked the rest of the fritters and you’re ready to eat. 100g full-fat soft cheese, softened by breaking down with a fork (or use Waitrose Duchy Organic Soft Cheese straight out of the tub). Peel, stone and mash the avocado with the lemon juice then mix together with the soft cheese, sea salt and cayenne pepper to taste until it is completely smooth and creamy - this is best done in a food processor or with a hand-held blender. 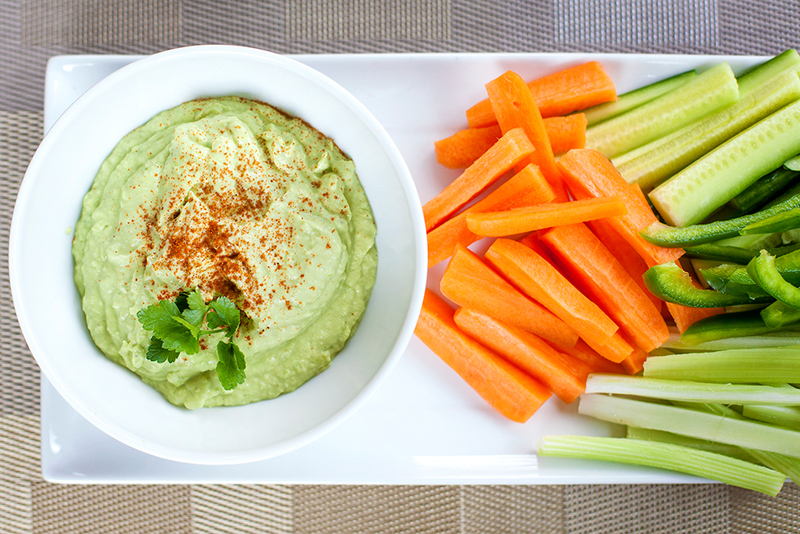 Serve as a dip with Green Pea Fritters or crudités. In a large bowl, toss the cauliflower florets in 2 tablespoons of olive oil and season with freshly ground black pepper. Tip onto a non-stick roasting tray and roast for 25 minutes, turning occasionally until the cauliflower is nicely browned. Remove from the oven and set aside. In a wide, shallow pan set over a moderate heat, fry the onion in the remaining olive oil with the pan lid on for about 8 minutes, stirring from time to time, until softened and starting to brown. Add the mushrooms and ginger and cook for another 1-2 minutes, stirring. Stir in the spices and bouillon powder and cook for another minute. Add the coconut milk and season to taste. Bring to the boil then stir in the cauliflower. Reduce the heat to low, cover the pan and cook for about 5 minutes. Ladle into warmed bowls and top with plenty of fresh coriander. I was in two minds about the Primal Pronto status of the Green Pea Fritters and Roasted Cauliflower & Mushroom Curry because both these recipes are so easy and fuss-free. In the end I decided that Primal Pronto should be defined as: a recipe with 5 or less main ingredients, or one that can be prepped, cooked and on the table within 45 minutes. The Roasted Cauliflower & Mushroom Curry didn’t quite make it on both counts (realistically it’s takes more like 50 minutes to make) but it is still wonderfully warming comfort food that’s simple to prepare. It’s also suitable for vegans. You can defrost the peas quickly by putting them in a heat proof jug and pouring boiling water over. Allow to stand for a few minutes, then drain well and proceed with the recipe. The uncooked pea fritter batter can be made well in advance and stored in the fridge overnight. The mixture will make approximately 16 small or 8 large fritters. I use a heaped tablespoon to make the bite-sized ones and a ¼ US cup for bigger ones. Two large Green Pea Fritters per person served with a medium/soft boiled egg and a dollop of avocado cream is great for a fast and easy low-carb brunch or supper. If you can’t get button mushrooms for the curry, use closed-cap mushrooms cut into halves or quarters instead. The Brits love sausages. Grilled or fried to perfection, and piled on top of creamy ‘mash’ and slathered in onion gravy, or put to bed in a soft pillowy bread roll with tomato ketchup - sausages taste great! As a teenager, I certainly thought so. Every Sunday night a crowd of us would leave our church youth club and walk into town to catch the bus home. There was a burger stand next to my bus stop that sold what we thought were the most delicious hot sausage ‘cobs’ (a Northern English word for bread rolls) with HP sauce. Myself and my boyfriend, who always walked me to my bus stop before crossing town to catch his own bus home, would shelter together in a shop doorway, like young lovers do, to eat our late night feast before saying a long and wistful goodbye prior to my return to weekly boarding school. My father too always prided himself on buying ‘proper’ fresh sausages from a traditional butcher and would travel 25 miles across the county of Nottinghamshire for the privilege. Whilst nothing like the mass-produced muck that you find on today’s supermarket chiller shelves, my dad probably didn’t realise that sausages per se are one of the oldest processed foods in history and, despite their reputation for tasting good, most sausage-making is almost certainly best done behind closed doors! Although sausages are currently making a comeback with the consumption of them soaring, producers bulk out their sausages with scraps, fat, cereal, chemical preservatives and water. In my view, it’s high time for a sausage re-think. I don’t want sausages packed out with cereal and other nasties and I don’t want to cause farm animals immeasurable suffering just so I can eat them. Notwithstanding the risks to our health, if you’re a pig, any mention of sausage is never going to be a good idea! The highlight of many a British BBQ, a cooked English breakfast, or a child’s favourite meal of sausage and baked beans, I think it is perhaps more the walk down memory lane that’s responsible for our adult sausage cravings, rather than the reality of what they are and where they come from. But there is a kinder and healthier way to satisfy our desire. Today’s blog post features no ordinary ‘bangers and mash’. It is a no-meat, grain-free, potato-free, alternative to this great British staple, which is nonetheless every bit as comforting and tasty as the original and, most importantly, looks just like people think ‘sausage and mash’ should! For taste and texture these cheesy veggie sausages are as close to their meat counterparts as ‘damn it’ is to swearing! Plus, they cook like a dream (see note below) because they don’t spit and splutter like ‘bangers’ do. Fabulous with low-carb creamy cauliflower mash and served with a deeply satisfying vegetarian red wine and onion gravy, it is the best transition to autumnal comfort food that you could ever hope for. Put the grated cheese, spring onions, ground almonds, ground flaxseed, banana flour, bouillon powder and herbs into a large mixing bowl and mix everything together well. Add the beaten eggs and a generous amount of seasoning, then using a fork or your hand bring the mixture together so it binds into a soft cheesy dough-like consistency. Cover the bowl with cling film and set aside to chill in the refrigerator for a couple of hours. When the sausage mixture is thoroughly chilled, form into 12 large sausages - about 7.5cm (3”) long, weighing approximately 85g each. Pour a large glug of olive oil into a large non-stick frying pan and set it over a high heat until the oil is really hot. When the surface of the oil starts to shimmer shallow-fry the sausages until deep golden brown and crispy on all sides, about 5-6 minutes. Drain the cooked sausages on paper kitchen paper. Serve hot with the creamy cauliflower mash, red wine & onion gravy and peas for a low-carb, vegetarian ‘twist’ on a favourite British classic. Heat the olive oil over medium-high heat in a large pan. Add the onion and coconut palm sugar to the pan, then cover and cook, stirring occasionally, for 4 minutes or until beginning to brown. Reduce the heat to medium/low and continue to cook with the pan lid on for another 15 minutes, stirring from time to time, until the onion is deep golden brown. Add the banana flour and stir over the heat for another minute to incorporate, then gradually stir in the stock and wine. Bring to the boil, stirring continuously until the sauce has thickened, then turn the heat back down to low. Add the bay leaf (or thyme sprig) and gently simmer for another 20 minutes. Remove the bay leaf. Serve this intensely flavoursome gravy really hot with sausages and other vegetarian savoury dishes. Place the cauliflower in the top half of a steamer with the bay leaf tucked in-between the florets. Pour the boiling water from the kettle into the bottom half of the steamer, add some sea salt then bring back to the boil. Steam the cauliflower with the pan lid on for about 8 minutes, until it is cooked through. Tip or spoon the cauliflower into a large bowl and allow it to cool down for a couple of minutes - this will let the steam evaporate and make for a drier mash. Remove the bay leaf. Using a stick blender or food processor, whizz the cauliflower into a rough puree. Add the salt, pepper, nutmeg and cream cheese then briefly process again into a creamy mash consistency. Put the cauliflower mash into a clean pan and gently re-heat, stirring from time to time so it doesn’t catch on the bottom of the pan. Serve hot as a delicious low-carb alternative to mashed potato. Keep the formed ‘sausages’ really cold (in a refrigerator) until you’re ready to start cooking them. This will ensure that they stay sausage-shaped in the cooking process i.e. cook to a crispy exterior before the cheese gets a chance to melt and they become misshapen. For the same reason, it is important not to overcrowd the pan because this lowers the temperature of the oil. You want your sausages to fry quickly in the hot oil, not semi-steam, which can cause them to ‘squidge' out of shape as you’re turning them over in the pan (also causing them to absorb more oil). The uncooked sausage mixture will keep for several days in a refrigerator. With this recipe being hot-off-the-press I haven’t tried freezing it yet but I think that would probably work too. If you want a smooth gravy i.e. without onion bits, strain through a fine sieve into a clean pan before re-heating and serving. If you think the finished gravy is a little too thick just add more water to thin it out to your liking. I used steamed cauliflower to create a creamy ‘mash’ that’s very similar to - albeit a lighter, low-carb version of - mashed potatoes. Sweet potatoes, carrots, celeriac, swedes, parsnips and turnips - either alone or in combination - all make a good alternative to potato mash. Just be wary of stacking up the carbohydrates when you eat the sweeter root vegetables i.e. parsnips and sweet potatoes. Flushed with success from creating a recipe for Grain-Free Scones with the taste and texture of a traditional wheat-flour scone last week, I was supposed to have taken time out to relax and enjoy my own Mothering Sunday weekend (a one-day celebration doesn’t seem enough for a lifetime’s effort!) However, it wasn’t to be - the best laid plans and all that - because on Saturday morning I woke up ridiculously early (2:30am), with the thought that I had to develop a recipe for low-carb, potato-free, breadcrumb-free fishcakes! This almost impossibly idealistic notion haunted me for the rest of that night and the next four days! Whilst authentic Thai fishcakes, those tasty, slightly rubbery morsels that rely on raw fish and egg white to hold them together, do in fact fulfil my criteria for low-carb, no breadcrumbs or potato, I wanted my fishcakes to be of the classic British variety - with a soft fluffy middle and a bit of crunch on the outside. A comfort food that can simply be speared with a fork, smeared with tomato ketchup and eaten as my no-fuss interpretation of fast-food, or perhaps dressed-up for a satisfyingly simple retro meal. Trickily, the texture, taste and appearance of mashed potato is unique to (not unsurprisingly) potatoes! How to replicate? I didn’t want the carb count of mashed parsnips or yam, the wetness of mashed celeriac, or the orange colour of sweet potato. Finally, I settled on cauliflower (at least it’s the right colour) and coconut flour (to bind it all together) and…er, that would be a no! Far too dry and crumbly, the fishcakes disintegrated before you could get them into your mouth. Last evening, tired and weary from a day of helping Mirror Imaging Photography catch up on their admin (or was it two days of non-stop thinking about how to develop my fishcakes?) I finally cracked it! Unsophisticated it may be, but nonetheless, the marriage between a light potato-style mash and fish just works, so if you’re a Primal convert and feeling fish-and-chip-shop deprived, this equally delicious potato and breadcrumb-less fishcake is very good news indeed! 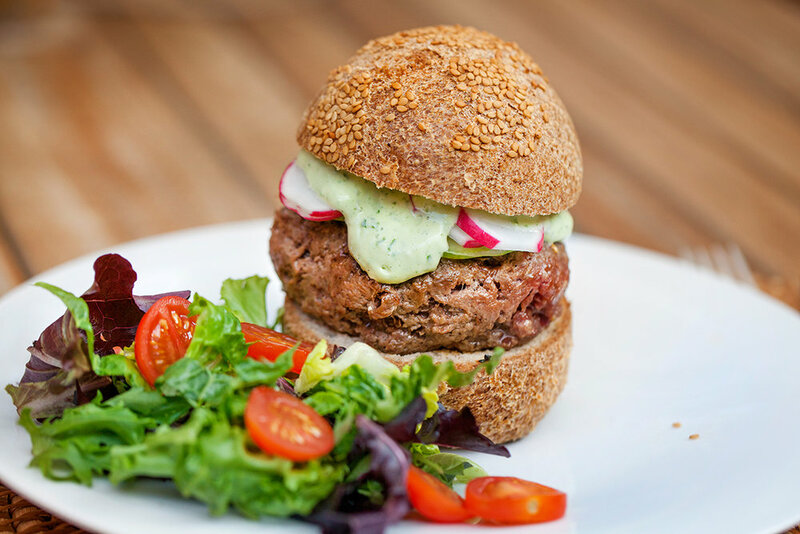 With the Lemon Butter & Chive Sauce, a fresh green salad would be perfect for a light supper or lunch. Without the sauce, tomato and mozzarella salad would be good, so would guacamole (spicy avocado dip) or, quite simply, some cooked frozen peas and a low-sugar organic tomato ketchup for dunking. Easier and quicker to make than traditional fishcakes (because there’s none of the threefold messing about dipping them in flour, egg and breadcrumbs), I think these healthy-looking (the lovely pale green colour comes from an abundance of fresh herbs) and authentic-tasting fishcakes are destined to become a new Primal, low-carbohydrate classic. Put the fish into a large flat pan (big enough to hold all the fish in a single layer), pour over the milk and 150ml (¼ pint) water. Bring to a simmer, then gently cook the fish skin-side down for 4 minutes. Take the pan off the heat, turn the fish over and leave to stand, covered with the pan lid, for a further 10 minutes. Drain the fish and place on a large flat plate, skin and remove any bones if necessary and set aside to cool. Meanwhile, cut the florets off the cauliflower (only the florets, you don’t need any stalk) and in a food processor blitz them for about 20 seconds into cauliflower grains - a sort of cauliflower ‘snow’. Place the cauliflower snow in the top half of a steamer with a couple of bay leaves. Pour the boiling water from the kettle into the bottom pan of the steamer, bring back to the boil then steam the cauliflower for 4 minutes with the pan lid on. Have a clean towel laid out ready on your worktop. Using a draining spoon, deposit the just cooked cauliflower onto this. Remove the bay leaves and allow to cool down for about 5 minutes. When cool, wrap the cauliflower tightly up inside the tea towel and wring it out as forcibly as you can to remove as much liquid from the cauliflower as possible. N.B. wet mash is death to fishcakes! Put the dried-out cauliflower pulp into a bowl with the herbs, lemon zest and cream cheese. Blend together thoroughly with a hand blender to form a smooth mash (this can be done more easily in a food processor) then season well with salt, pepper and cayenne. N.B. The mash needs to taste really flavourful at this stage. Break the cooled fish into large flakes and add to the cauliflower mash, combine thoroughly with a fork but make sure you leave a good percentage of the fish flakes intact for texture. The mixture should be soft but firm enough to hold its shape when squashed together. Taste, if the mixture needs extra seasoning, add it now. Put the ground almonds onto a large flat plate. Mould the mixture with your hands into six even-sized rounds (about 125g to 130g per fishcake and approx 2cm / ¾ inch thick), then carefully dip each fishcake into the ground almonds, coating thoroughly. Place the fishcakes on a clean plate and put in the fridge for 30 minutes to firm up. Remove the cooked fishcakes, place on a paper towel lined plate and keep warm in a pre-heated low oven whilst you repeat with the remaining fishcakes. To make the lemon butter and chive sauce: heat the butter in a small saucepan over a low to moderate heat. When the butter has melted and is just starting to bubble add the lemon zest and juice to the pan and simmer gently for 2 minutes. Add the cream, then gently simmer for a further 4 minutes. Season with salt and freshly ground pepper. Just before you’re about to serve, gently re-heat the sauce and stir in the finely chopped chives. Don’t be tempted to use whipped, ‘light’ or reduced-fat cream cheese for this recipe - it needs to be full-fat soft/cream cheese to help bind the cauliflower mash together. I use a ½ US Cup to quickly measure the amount of mixture for each fishcake - pack the mixture down firmly into the measuring cup, level it off and then sharply knock the fishcake out of the cup into the palm of your other hand before shaping, i.e. flattening out, into rounds. If the pan and frying oil looks dirty after frying the first batch of fishcakes, clean the pan out with kitchen paper and heat up some fresh oil before continuing with the remaining fishcakes. To make Perfect Poached Eggs - using Poaching Pods, cook your eggs (one large egg per person) for exactly 5 minutes, i.e. the same amount of cooking time required for the second batch of fishcakes after they’ve been turned over. To cook spinach (serves 4): Remove the stalks from 500g (1lb) young spinach leaves, wash the leaves and shake off as much water as possible (I do this in a salad spinner). Warm 50g (2oz) butter in a large non-stick saucepan over a medium-high heat. When the butter is melted and is starting to bubble, add the spinach to the pan (you may have to do this in 2 or 3 batches - stir-frying each batch of leaves until they collapse down to make room in the pan for the rest). Cook the spinach for 2-3 minutes, stirring continuously until all the leaves are wilted and tender. Don’t overcook, it should provide a burst of bright green on the plate - not be grey or mushy! Take the pan off the heat and drain the spinach in a colander, using a potato masher or the back of a wooden spoon to press out any excess liquid. Put the spinach back into the still hot pan, loosely break it up with a fork, then lightly season with salt and freshly ground pepper and a pinch of nutmeg. Serve warm. It’s not really warm enough outside to be thinking about ice cream but when faced with yet another bowl of over-ripened bananas, what to do? Well, it could have been Banana Poppy Seed Cake with White Chocolate Vanilla Bean Frosting, but in fact it was a recipe for Banana Cashew Ice Cream in last month’s edition of Waitrose Kitchen adapted from Hugh Fearnley-Whittingstall’s latest book River Cottage Light & Easy: Healthy Recipes for Every Day that really grabbed my attention because it looked to be, and in fact is, dead simple to make, problem-free and above all, refreshingly delicious. My ice cream just naturally evolved into Banana Cashew & Rum Ice Cream because banana flavour marries so well with rum that I couldn’t resist adding a tablespoon or three of alcohol to the recipe! Nor is my version dairy-free, since the colour (the bananas discolour whilst you’re waiting for the mixture to cool) and the texture are enhanced by adding double cream (it makes for a paler and creamier ice). Furthermore, as the total carbohydrate count is identical for both recipes there’s no need to beat myself up over the extra indulgence! In fact, in for a penny in for a pound, I suggest you serve this ice cream with hot chocolate sauce spooned over. As ever, the quality of your ingredients will determine the results. Hold your nerve with the bananas - they need to be ripened to the stage where the skins are beginning to be mottled with black. Also, make sure that you buy the finest chocolate you can afford (at least 70%). You can then sit back because you will have created something totally scrumptious. Banana, rum and chocolate is simply a flavour match made in heaven, add to that the contrast between hot and cold and we could all be screaming for ice cream! Peel the bananas and break into chunks. Put them in a blender with the drained cashews, honey, lemon juice and 100ml cold water and blend until smooth. Pour into a jug and press a piece of cling film directly on top of the liquid and up the sides of the jug to prevent air getting to it - this will minimise the bananas discolouring. Chill until cold. When cold enough, stir in the chilled double cream then gradually start adding the rum a tablespoon at a time, tasting as you go. Even if you like it strong, 4 tablespoons is probably the optimum amount you’ll need. Churn the ice cream in an ice cream maker until it is the consistency of very thick cream, then quickly transfer to a plastic freeze-proof container and freeze until solid. In a small pan heat the cream to scalding point (just below boiling). Take the pan off the heat. Add the chocolate to the cream, whisking continuously until the chocolate is melted and you have a smooth sauce. Add the vanilla essence and finally whisk-in the butter. Gently re-heat the sauce if necessary but do not allow it to boil. Spoon immediately over ice cream. Alternatively, keep warm over a pan of barely simmering water until you're ready to serve. I like the convenience of always having a jar of good quality mayonnaise in my refrigerator. Unfortunately, even the best organic mayonnaise I can buy has corn syrup, corn starch and agave syrup in its line-up of ingredients. So, as far as eating a Primal diet is concerned, it doesn’t cut the mustard. However, if you commit to making your own mayo, there’s still the problem of deciding what is the healthiest and the best-tasting oil to use. The choice is bewildering! For health reasons I’d choose an organic, unrefined, cold-pressed oil such as extra virgin olive oil, avocado oil or macadamia oil. Unrefined oil, which usually means the oil is cold-pressed (mechanically extracted by pressure rather than heat) is much better for you because it retains all its nutrients and flavour. On the other hand, for the non-overpowering taste and pale look of shop-bought mayonnaise, a refined oil would produce something that’s much more like Hellman’s, which is what most people think is the ‘real deal’ of mayonnaise. The issue is, I do not want to use refined oils in my cooking because the likes of rapeseed oil (90% of the world’s rapeseed crop is genetically modified! ), canola oil (canola oil is extracted from rapeseed), rice-bran, grape-seed, sunflower or pure and light olive oils are subjected to chemical solvents, de-gumming and neutralisation (doesn’t even sound healthy does it?) and this processing removes some of the oil's nutrients and essential fatty acids, as well as their natural flavour and colour. Consequently, when it came to making mayonnaise for this blog post I found myself having a “Daddy or chips?” moment! I’ve previously tried making mayonnaise using the best quality organic cold-pressed olive oil (the classic ingredient used for making homemade mayo) and believe me it tastes downright nasty! Its flavour profile is just far too bitter and overpowering for a salad dressing, to be lathered on top of a sandwich, to make a self-respecting egg mayonnaise or as a complement to chicken, meat or fish and, as far as I’m concerned, it would be absolutely ruinous to chips! I’ve also tried avocado oil, which wasn’t much better. Furthermore, both unrefined olive and avocado oils impart a dark greenish hue to the finished mayonnaise, which I find unattractive. I really just want my mayo a pale-ish golden colour, please! I still have a bottle of macadamia nut oil waiting in the wings, but for now I’ve decided it’s just a bit too pricey for another culinary mistake, so I decided to use a hybrid version of cold-pressed organic sunflower oil today and…whoop-de-doo-da! Third time lucky! The reason the Primal community usually tries to avoid sunflower seeds and sunflower seed oil is because they are really high in omega 6 oil. Not that there’s anything wrong with this per se, it’s just that most people are already into omega-6 fat overload (especially if they eat grains and grain fed meat) so the healthy balance between omega 3-6-9 fatty acids, which should be in the ration of 2-1-1 is all out of kilter with good health. But wait, not all sunflower oil is high in omega-6. There is an alternative high-oleic sunflower oil that’s organic, cold pressed, very stable at high temperatures (as in, suitable for deep fat frying) and has the same monounsaturated fat found in olive oil and your very own adipose tissue. It’s totally tasteless too, which makes it a really good oil for Primal mayonnaise. So now you know what all the fuss is about, please try this recipe at least once in order to appreciate its enticing balance of velvety smoothness and precisely seasoned piquancy. This homemade mayonnaise can only ever make a Chicken Salad Sandwich (recipe coming soon) or in this case, Sweet Potato Chips even nicer! I promise you, shop-bought mayo doesn’t come anywhere close to the real thing. Put the chips into a large bowl with the olive oil and sea salt, mix thoroughly together with your hands so that the chips are evenly coated in the oil and salt. Spread the sweet potato chips out onto a lipped baking tray in a single layer. Roast in the oven for 20 minutes, then take the tray out of the oven and turn the chips over to ensure even browning. Return to the oven for a further 10 to 15 minutes until they are nicely crisp and brown. Remove from the oven, and tip on to plate lined with a paper towel. Sprinkle over a little more sea salt, if liked and serve immediately with homemade mayonnaise. Make sure that all the ingredients are at room temperature before starting. Combine the oils in a drip-free jug. Whisk the egg yolks, salt, pepper, mustard power and cider vinegar in a bowl for a a minute or so. Gradually and slowly start to add the oil to the egg yolk mixture a drop at a time, keep whisking all the time after each addition of oil to ensure it is properly incorporated before adding more oil. Do not try to rush things at this stage otherwise the mayonnaise will split. Keep adding the oil drop by drop. As the mixture thickens, you can then start to add it more quickly. By the time all the oil is added you will have a thick stable mayonnaise that holds its shape. Taste it, adding more salt and pepper, mustard, lemon juice or vinegar and a drop of liquid stevia, only if you think it needs it. You can also add other flavourings such as chopped herbs. If you would prefer a thinner mayonnaise, add a little warm water (1-2 tablespoons) as well. Keep the mayo refrigerated until you’re ready to eat it. This quantity of mayonnaise makes enough for 8 people. Halve the recipe if this is too much for your family to get through within 3 days - it needs to be eaten within that time due to the inclusion of raw eggs. In spite of us being in the midst of a 21st century obesity epidemic, many people still believe conventional wisdom, which says calorie counting and a low-fat diet is the key to weight loss. The reality is, if you’re trying to lose weight and stay that way, it’s sugar in all its forms that you need to seriously restrict, not healthy fats. Remember, essential fatty acids are just that. They are ’essential’ because the body needs them, it can’t make them and they must be obtained from the food you eat, so please don’t try to omit healthy fats from your diet. It’s worth noting that unrefined oils, such as Coconut Oil, is 100% fat but is said to aid in weight loss! I personally take daily supplements of fish and butter oil to ensure I get enough of the omega-3 fatty acids. These are associated with many health benefits including protection from heart disease and stroke. New studies are identifying potential benefits for a wide range of other conditions including cancer, inflammatory bowel disease and other autoimmune diseases such as lupus and rheumatoid arthritis. Back in the 1970’s, due to a lack of money and much to my husband’s irritation, cauliflower cheese, along with jacket potato and tuna bean salad used to be the mainstay of our diet. It was the repetitive appearance of cauliflower cheese that offended him the most. We’re not together now but I do wonder if he’s carried his grudge against cauliflower with him for the past thirty-five years! If so, it would be a pity because today’s recipe for Souffléd Cauliflower with Gruyere Cheese Sauce is a far cry from the boiled cauliflower with the flour-based béchamel cheese sauce of our yesteryears, which I confess (too late as far as my ex is concerned!) was a truly monotonous thing to eat no matter how liberally I attempted to mask it in cheesiness. This no-grain, low-carb version is really an elegant deconstruction of boring old cauliflower cheese that I think is simply brilliant as an imaginative vegetarian main course or as an accompaniment to fish, chicken or meat. It’s amazing what a little bit of height and lightness can do for cauliflower jaded appetites and with the silky-smooth Gruyere cheese sauce poured over, it’s totally transformed into something enticingly delish. Do not be intimidated by the thought of making a soufflé - they’re really not as difficult or as temperamental as you might think. You’ll need a 6-inch diameter top (No.2 size) soufflé dish for this recipe. Pre-heat the oven to 190℃ / 375℉ / Gas mark 5. Boil a kettle of water. Butter the soufflé dish and dust with the ground almonds. To allow the soufflé to rise above the dish, tie a deep band of non-stick baking parchment or greaseproof paper around the outside of the dish to come 2-3 inches higher than the top of the dish. Cut the florets off the head of cauliflower - you don’t need much stalk so just use the florets. Put the florets in a single layer in the top of a steamer, sprinkle over with salt and tuck the bay leaf in-between. Pour the boiling water from the kettle into the bottom half of the steamer and steam the florets until they’re tender (about 7 minutes). Refresh the cauliflower in cold running water, remove the bay leaf (if used) then drain well and tip the cauliflower on to a clean tea towel to dry. Pulse the cauliflower in a food processor into a puree (alternatively, push the cauliflower through a strainer). Put the cauliflower puree into a bowl. Prepare the béchamel sauce. In a medium pan set over a low to moderate heat melt the butter, when the butter is melted add the ground almonds, the mustard and arrowroot powders and stir everything together really well. Keep stirring continuously whilst you gradually add the milk to the pan a little at a time. Make sure after each addition of milk that it is evenly and smoothly incorporated into the butter and flour mix before adding more milk. When all the milk has been added to the pan, bring the sauce up to the boil to allow it to thicken - continuously stirring until it does. Take the pan off the heat and mix the béchamel sauce in with the cauliflower. Season well with salt and freshly ground black pepper. Separate the egg yolks and whites. Thoroughly beat the yolks and add them to the cauliflower mixture. With a clean whisk whip the egg whites to a firm snow. Using a large metal spoon, quickly fold a third of the egg whites into the cauliflower mixture to loosen it, then gently fold in the rest of the egg whites being very careful not to knock the air out of the mixture. Turn into the prepared soufflé dish, dust with the Parmesan cheese and stand it on the centre shelf of the oven. Bake for about 30-35 minutes until it is well risen and brown. The soufflé should be a little soft in the centre. Whilst the soufflé is baking, prepare the Gruyère cheese sauce. Heat the creme fraiche in a saucepan without letting it boil. Add the cheese and Dijon mustard and whisk continuously until the cheese melts. Remove the pan from the heat and set the sauce to one side until you need it. Just before the soufflé is ready, gently re-heat the sauce and tip into a warm sauceboat. When the soufflé is cooked, serve it immediately with the Gruyère cheese sauce handed separately. Tuesday 17th February 2015 is Pancake Day! It must be at least 25 years since I last allowed myself the indulgence of eating pancakes. My prohibition began with the Hay System Diet, a diet that promotes separating food into three meals a day - one meal carbohydrate, one protein and the third entirely alkaline. I followed the Hay Diet, which subsequently evolved into Vegetarian food combining, for over two decades. Thanks to this brilliant grain-free pancake batter recipe all things ‘pancake’ have been at the forefront of my mind recently - big time! Sweet or savoury, perfect pancakes have the potential to fill so many of the previous gaps in my culinary repertoire. Spiced Fruit Scotch Pancakes is my first offering. Stacked high and served with sugar-free Orange & Apricot Syrup and perhaps a dollop of creme fraiche, it makes for a very impressive dessert when entertaining. Alternatively, leave out the fruit and spice and serve these little beauties plain for a lazy Sunday breakfast, perhaps accompanied by a mixed berry compote (recipe to follow in due course!) or with fresh blueberries and a drizzle of maple syrup. Blend all the basic pancake batter ingredients in a blender. Fold in the mixed spice and mixed dried fruit. Set aside. Add some coconut oil to a pre-heated non-stick frying pan. Drop good tablespoons of batter into the pan (one spoonful per pancake - obviously these need to be cooked in batches). Even them out slightly with the back of a spoon then leave alone to cook for 2 - 3 minutes (small bubbles will appear on the surface when they’re ready to turn). Cook for 2 minutes more, until the pancakes are cooked through, then remove from the pan. Cover with a tea towel to stop them drying out. To serve, warm through in a low oven and stack them into a tower on each plate, allowing four to five per person. Drizzle Orange and Apricot Syrup around the pancake stack and top with a spoonful of creme fraiche, if liked. Heat all the ingredients together in a small saucepan over a low to medium heat for 3-4 minutes. When bubbling and slightly reduced, pass through a fine sieve into a bowl, pressing as much of the apricot flesh through as possible. Return to a clean pan and gently warm through when ready to serve.